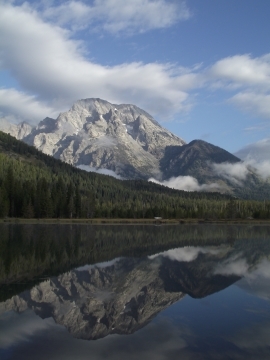 Construction will be underway this summer at the Deadmans Bar Road, parking area, and boat launch in Grand Teton National Park. The project will improve the road surface, expand and formalize the parking area to improve traffic circulation, provide better access to the Snake River, and re-vegetate areas that have been impacted by overflow parking in the past. While the construction schedule has been designed to maintain access during the heart of the busy summer season, the road will be closed during the shoulder seasons to accommodate crucial road work that cannot be completed on the narrow road with traffic present. When the Deadmans Bar Road is closed, river users will still be able to make a through trip from the Pacific Creek Boat Launch to Moose, however there will be no formal river access between those two locations. Restrooms at Deadmans Bar will remain open throughout the project, including when the road is closed. The project will improve the experience of visitors to the Deadmans Bar area and the sustainability of the facilities. Work on the Deadmans Bar Road includes an overlay of the existing paved sections of road and establishment of a consistent 20-foot width on the gravel portion of road to better accommodate two-way traffic. Crews will expand the gravel parking area by less than an acre and delineate parking spaces to improve efficiency. Future visitors to the area will also enjoy a hardened boat ramp designed for dynamic river conditions, accessible parking spaces and river access, and improved signage and traffic flow. Areas that have been used as informal overflow parking in the past will be revegetated. This project is a part of the Snake River Headwaters Comprehensive River Management Plan. 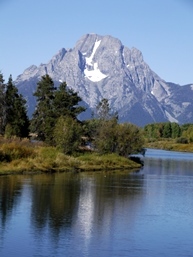 The Snake River Headwaters was designated a national wild and scenic river in 2009 to protect its free-flowing character, water quality, and opportunities for its benefit and enjoyment. Signal Mountain Summit Road: Closed 10 am to 4 pm on Tues, Wed, and Thurs from mid-June through early July. You'll still be able to reach the summit by using the Signal Mountain Trail. A new National Park Service (NPS) report shows that 4.1 million visits to Yellowstone National Park in 2015 totaled $493.6 million in spending in communities near the park. That spending supported 7,737 jobs in the local area and had a cumulative benefit to the local economy of $638.6 million. * Paved multi-use pathways are open when they are predominately free of snow and ice. All backcountry camping permits cost $25. Backcountry reservations may be made until May 15 with an additional $10 fee for advanced booking. Reservations can be made online at Recreation.gov. After May 15, all backcountry site permits are issued on a first-come, first-served basis no more than one day before the trip begins. The Moose, Moran, and Granite Canyon entrance stations are open and charging entry fees. Bicyclists are reminded that they must stop and show an entry pass before proceeding through the gates, just as vehicles are required to do. An automated self-serve machine is located on the multi-use pathway adjacent to the Moose Entrance Station. People traveling on the pathway by foot, bike, or rollerblade will be required to stop and pay or have a valid pass in possession. 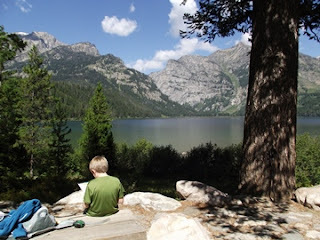 For additional information about activities and services within Grand Teton National Park or the John D. Rockefeller, Jr. Memorial Parkway, please visit the park's website, stop by any visitor center, or call 307.739.3300. For detailed information on hiking trails in the park, please click here. There's no time like the present to begin planning for the future. Yesterday I just happened to come across a website that mentioned there will be a total eclipse of the Sun next year. This is significant because it will be the first total solar eclipse visible from the contiguous United States since 1979. Next year's lunar/solar event will take place on Monday, August 21, 2017. 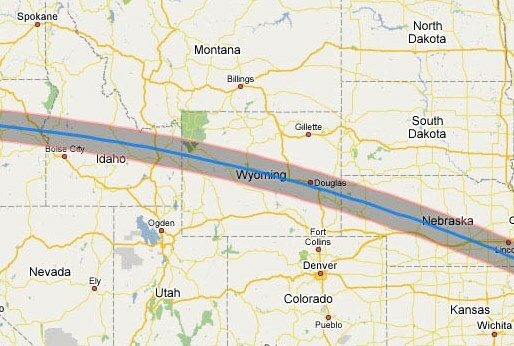 The path of the total eclipse will pass directly over Grand Teton National Park, with the center passing between Wilson and Teton Village. Biologists with the Interagency Grizzly Bear Study Team will be conducting grizzly bear research and trapping operations within Grand Teton National Park beginning Wednesday, April 13, through April 30. This research is part of on-going efforts required under the Endangered Species Act to monitor the population of grizzly bears in the Greater Yellowstone Ecosystem. Trained professionals with the interagency team will bait, trap and handle grizzly bears in accordance with strict protocols. Once trapped, the bears are sedated to allow wildlife biologists to collar the bears and collect samples and data for scientific study. The Interagency Grizzly Bear Study Team was established in 1973 to research and monitor bears across the Greater Yellowstone Ecosystem in a collaborative effort between federal land managers and state wildlife agencies. Gathering of critical data on these protected bears is part of a long-term research effort to support the recovery of the area's grizzly bear population. 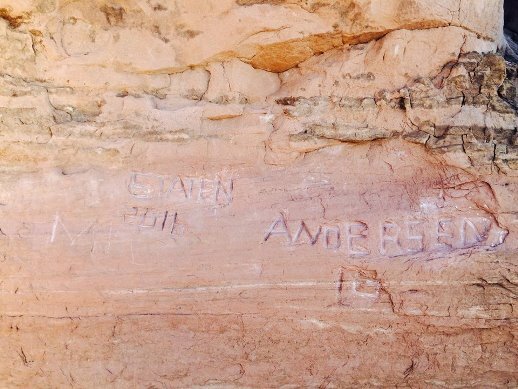 The team includes representatives from the National Park Service, U. S. Geological Survey, U.S. 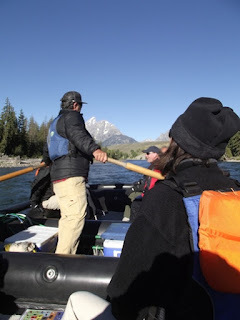 Fish and Wildlife Service, U.S. Forest Service, Eastern Shoshone and Northern Arapaho Tribal Fish and Game Department, and the states of Idaho, Montana and Wyoming. The National Park Service announced today that Many Glacier and Chief Mountain Roads on the east side of the Park are now open to vehicles for the season. 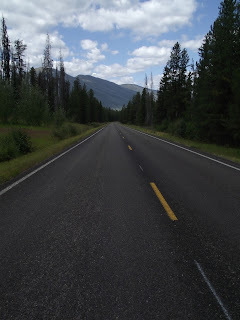 Visitors are welcome to drive the 8-mile Many Glacier Road as far as the Many Glacier Campground. The Swiftcurrent Nature Trail loop on the valley floor is open in its entirety with parking available at Grinnell Picnic area. Currently, no services are available along the Many Glacier Road with the exception of pit toilets at the ranger station and picnic area. The access road to the Many Glacier Hotel is closed due to construction at the hotel. Temporary parking for hotel trailheads is available along Many Glacier Road at the “T” junction with the road to the hotel. To access trailheads beyond the hotel, visitors should follow posted signs from the junction and stay clear of the posted construction zone. On both the east and west sides of the Going-to-the-Sun Road (GTSR), avalanche concerns have prevented plowing operations from advancing since Wednesday. Park officials are recommending that hikers and bikers use caution if they plan to travel on the GTSR this weekend. Sometime between Wednesday afternoon and Thursday morning this week, two large glide avalanches released at Haystack and Heaven’s Gate, according to a park avalanche report. Both of these were large magnitude events with the debris running several thousand feet down into the valley bottoms. The avalanche at Haystack is blocking the GTSR where road crews had previously plowed the road and debris is plugging the stone archway that spans Haystack Creek. The report also notes that three separate glide avalanches occurred last weekend. West side plowing crews discovered the 30-foot deep avalanche debris at Haystack on their way up to plow the road on Thursday morning. Due to continued avalanche danger, the crew returned to complete road work at lower elevations without plowing further up the road. On the west side of the park, visitors can drive the Camas Road and the first 11.5 miles of the Going to the Sun Road (GTSR) from the park entrance to Lake McDonald Lodge. Beyond the The National Park Service cares for special places saved by the American people so that all may experience our heritage. Lodge, people on foot or on bicycles can continue up the traffic-free road for another twelve miles to the Loop where the hiker/biker sign is currently located. For the next several days, due to avalanche danger, officials are advising recreationists not to travel above the Loop. On the east side of the park, vehicles may drive the first 5.5 miles of the GTSR from St. Mary entrance to Rising Sun. Beyond that gate, hikers and bicyclists may continue on the road as far as Siyeh Bend. For at least the next few days, travel beyond Siyeh Bend is not advised due to avalanche danger. Two Medicine Road is closed to vehicles at Running Eagle Falls, with no restrictions for hikers and bikers beyond that point. In addition to avalanche concerns, hikers and bikers are reminded that bears have emerged from their dens and that pre-cautions are advised, including carrying bear spray and making noise along roads and trails where visibility is restricted. Recreationists should be prepared for variable, spring conditions including mud, snow and patches of ice both on roads and trails. Since road conditions and openings change frequently this time of year please visit the park’s website or check the park’s social media sites or call 406-888-7800 for the latest information. On weekends, visitors can stop at the Apgar Visitor Center from 9:00 a.m. to 4:30 p.m. for the latest information. 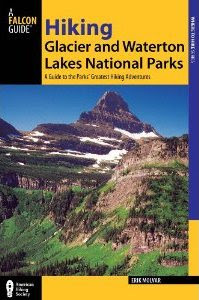 National Park Week continues with free entrance to all National Parks, including Glacier National Park, through April 24 in honor of the National Park Service Centennial. A new report released today concludes that visitors to Grand Teton National Park in 2015 spent an estimated $560 million in local gateway communities. The ripple effects of that spending had a cumulative benefit to the local economy of over $728 million and supported 8,862 jobs in nearby communities such as Jackson, Teton Village, and Dubois, WY as well as Victor and Driggs, ID. As it did in 2014, Grand Teton ranked among the top five national park areas in terms of economic benefit along with Blue Ridge Parkway, Great Smoky Mountains National Park, Grand Canyon National Park, and Denali National Park & Preserve. "My staff, as well as that of our partners and concessioners, welcomed over 3.1 million recreational visitors to Grand Teton National Park in 2015," said Superintendent David Vela. "We are proud to share the story of this place with those visitors and introduce them to this part of the country. National park tourism is a significant driver in our national and local economy, returning over $10 for every $1 invested in the National Park Service. While we are primarily responsible for the preservation and visitor enjoyment of park resources, we also value the health and sustainability of our local economy and our partnerships with the communities that help serve travelers from across the country and around the world." The peer-reviewed visitor spending analysis was conducted by economists Catherine Cullinane Thomas of the U.S. Geological Survey and Lynne Koontz of the National Park Service. The report shows $16.9 billion of direct spending by 307 million park visitors in communities within 60 miles of a national park. This spending supported 295,000 jobs nationally;252,000 of those jobs are found in these gateway communities. The cumulative benefit to the U.S. economy was $32 billion. Report authors also produced an interactive tool, which is new this year, to illustrate their findings. Users can explore current year visitor spending, jobs, labor income, value added, and output effects by sector for national, state, and local economies. Users can also view year-by-year trend data. The interactive tool and full report are available at the National Park Service Social Science Program webpage. The report includes information for visitor spending at individual parks and by state. National park visitors spent an estimated $890 million in local gateway regions while visiting National Park Service lands in Wyoming. Montana State Parks is seeking public comment on 79 Recreational Trails Program (RTP) grant applications for the current grant cycle which closed March 11, 2016. Project applicants requested approximately $2.6 million from Montana’s Recreational Trails Program. Approximately $1.4 million in funding will be available for projects. Comments will be accepted through Friday, May 20th at 5pm. Recreational Trails Program grant funds can provide assistance for trail projects, including development and rehabilitation work on urban, rural, and backcountry trails; planning and construction of community trails; snowmobile and cross-country ski trail maintenance and grooming operations; and, a variety of trail stewardship and safety education programs statewide. A list of all trails grant applications for consideration is accessible online (click on ‘Recreational Trails Program’). Copies of individual RTP applications are available by request at (406) 444-4585. Public Comments must be received by 5pm on Friday, May 20th, 2016 and may be submitted online here. 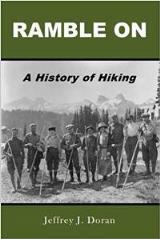 Comments may also be submitted by email to: FWPRecreationalTrails@mt.gov or by regular mail to: Montana State Parks, Trails Program, 1420 E. Sixth Ave., P.O. Box 200701, Helena, MT 59620-0701. The Recreational Trails Program (RTP) is federally funded and is administered and managed by Montana Fish, Wildlife & Parks with oversight from the Federal Highway Administration. RTP funding is made available through the recently passed Fixing America’s Surface Transportation Bill called the Fast Act which is a five-year funding bill. Ahhhh. Summer in Jackson. Where the days linger forever, the air is so crisp you’ll want to bottle it up and the adventures you’ll have here are endless. 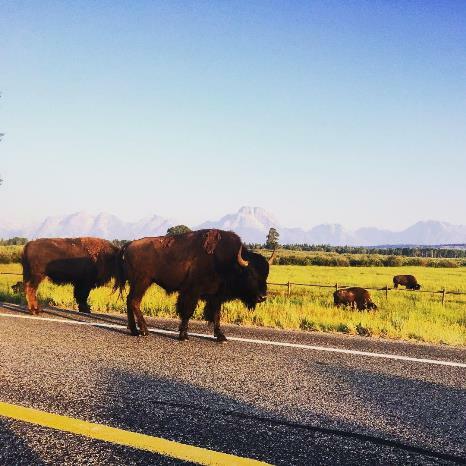 Once you experience a Jackson Hole summer day, you’ll soon be trying to figure out a way to extend your trip or better yet, plan your next one. There isn’t exactly a shortage of things to do in the valley once you get here. 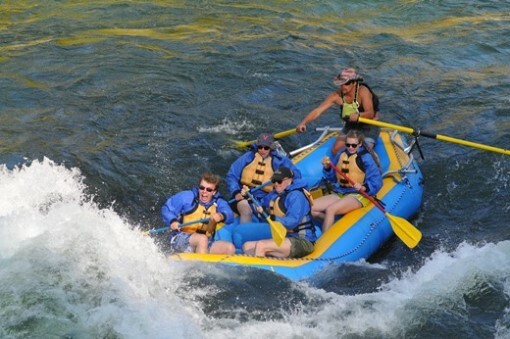 A personal favorite of mine is hitting the river and going rafting. You’ll soon learn that everyone and their mother (and probably their grandmother) has taken a rafting trip down the Snake River. Why you ask? Because it’s the most amount of good, clean fun you can have in Jackson in three hours or less! The day is a breeze. You roll up to the office 20-30 minutes before your trip, sign your life away fill out a waiver and jump on a bus to take you to your starting point. When you arrive, your guide/new best friend will give you detailed instructions on how the day will play out. Before you know it, you’re in the raft with all your new friends heading down the river. What to expect on the ride down the river? Well… a little bit of the unexpected. 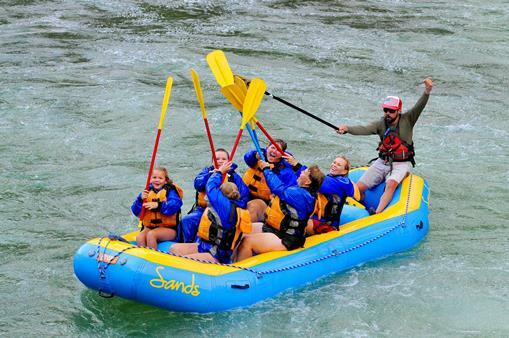 You’ll hit famous rapids like the Big Kahuna, Lunch Counter and Champagne. You’ll be bounced around a little or maybe a lot. You’ll laugh so hard your cheeks will hurt and the smile will inevitably take hours, maybe days, to be wiped from you face. Finish your trip by serving up high fives all around the boat with all your best friends. As you head back to town, a wave of adrenaline will overcome you. You’ve officially had a real Jackson experience. For those of us who live here, we just call that a normal day, so good on you for living it up like a local while you’re here. So… You’re coming to Jackson. You want to have the classic experience, yeah? Well, what are you waiting for?! Give us a shout and we’ll give you the classic Jackson Hole day and so much more. 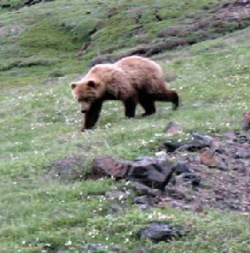 This is precisely why you should never venture into grizzly country without bear spray. The man interviewed in this National Geographic video survived severe injuries when he was attacked by a grizzly bear not far from his home near Cody, Wyoming. He explains why he feels guilty and says "it really wasn't the bear's fault." Two prescribed fire projects are planned along the Inside North Fork Road area of Glacier National Park in the next month, depending on weather and fuel conditions. NPS fire crews plan to burn 100 acres in the vicinity of Sullivan Meadow, approximately two miles east of Logging Ranger Station. The primary objectives of the burn are to reduce the number of understory trees serving as “ladders for fire” underneath mature ponderosa pine, thin out trees that established after the 1999 Anaconda Fire and the 2001 Moose Fire, and to expose mineral soil to provide a seed bed for natural ponderosa pine regeneration. A second prescribed burn of approximately 70 acres is proposed in Round Prairie approximately eight miles northwest of Polebridge. The primary objective of this burn is to reduce the density of young trees that are encroaching on the native prairie grassland. Managers also hope to reduce the sagebrush within the prairie while improving the vigor of the native grasses and forbs. These prescribed burns will only take place if optimum weather and smoke dispersal parameters are met. For additional information, please contact the park at 406-888-7800. 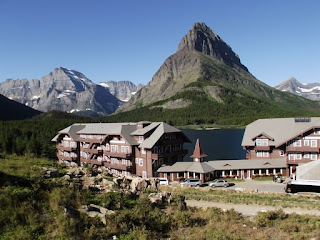 The National Park Service (NPS) awarded a 13.56 million dollar contract on March 16 to Swank Enterprises of Valier, Montana, to correct remaining health and safety concerns within the National Historic Landmark Many Glacier Hotel. In both the USFWS delisting rule and Montana state plan, Montana is required to maintain at least 150 wolves, including 15 breeding pairs. Wolves were officially delisted from the Endangered Species Act in Montana in 2011. The delisting required oversight by the U.S. Fish and Wildlife Service for five years to ensure wolves in Montana stayed above population minimums. That oversight period ends in May. Montana’s approach to wolf management includes hunting, trapping and management removal of problem wolves, which provides opportunities for hunters and trappers and the flexibility to address problems with isolated instances of wolf depredation. In 2015 the number of wolf depredations on livestock increased by 17 over the previous year to 64. This included 41 cattle, 21 sheep and two horses. The total documented wolf mortality in 2015 was 276 wolves, down from 308 in 2014. These numbers include all documented wolf deaths, including those from vehicles, poaching and disease. Included in this number are 39 wolves killed to address depredation issues in 2015, the lowest number in a decade and 18 fewer than last year. Twelve wolves were killed under Senate Bill 200 authority, which allows landowners to kill wolves threatening livestock or pets. The total number of wolves harvested by hunters and trappers during the 2015 calendar year was 205, which were eight fewer than in the 2014 calendar year. The recovery of the wolf in the northern Rockies remains one of the fastest endangered species comebacks on record. In the mid 1990s, to hasten the overall pace of wolf recovery in the Northern Rockies, the USFWS released 66 wolves into Yellowstone National Park and central Idaho. 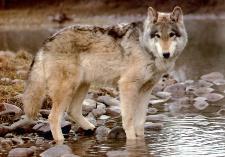 FWP began monitoring the wolf population and managing livestock conflicts in 2004. After several court challenges wolves were successfully delisted in 2011. To learn more about Montana’s wolf population, visit the FWP 2015 Annual Wolf Report.